What’s going to happen to Mike Hancock, former Liberal Democrat turned independent member of parliament for Portsmouth South? Plenty of people have been offering a view on what should happen to him. Both friend and foe have this week called on Hancock to resign as an MP after he made a public apology for an “inappropriate and unprofessional friendship” with a constituent. Nick Clegg said Hancock will be expelled from the party (he’s been suspended since 2013); David Cameron as good as said Hancock should stand down (though being careful to add: “It’s not for me to say when people should resign”); home secretary Theresa May has done the same. Meanwhile Flick Drummond, the Conservative candidate for Hancock’s seat, is reportedly helping her Tory neighbour in Portsmouth North with an increased workload from local constituents who have refused to see Hancock. A former MP for Portsmouth North, Labour’s Syd Rapson, has also said Hancock should go. If he does, the subsequent by-election would be one the Tories will be keen to win. The seat is not on their target list, but a by-election gain – as opposed to a hold, which is what happened as Newark – would do wonders for morale. It would also be rather historic. It has been decades since the Tories last gained a seat at a by-election while in government. Cameron will be hoping that Hancock has left enough of a toxic legacy in the constituency to encourage voters to switch sides. 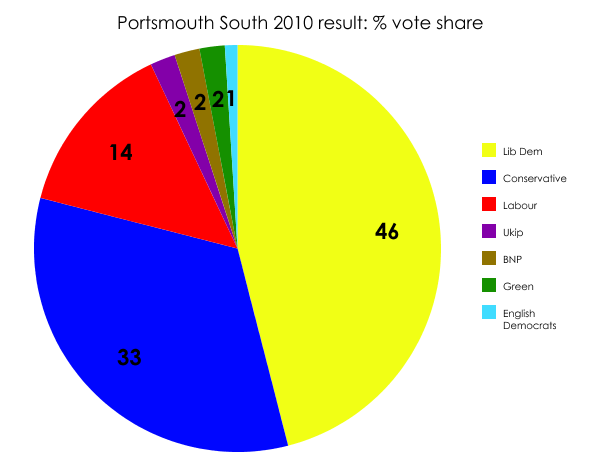 But what if the electors of Portsmouth South prove to be more anti-Hancock than anti-Lib Dem? Enough of the party’s core supporters turned out to elect a Lib Dem to replace Chris Huhne in Eastleigh, despite Huhne admitting to perverting the course of justice. And the circumstances in which the former Tory MP for Newark Patrick Mercer resigned didn’t cause the party to lose the subsequent by-election earlier this month. Maybe a tradition of punishing parties at by-elections for the behaviour of their former MPs has diminishing appeal. If Hancock holds on until the 2015 general election, regardless of whether he stands again or not, I would think the constituency has a good chance of moving back into the Lib Dem column. And given that Hancock is now formally an independent MP, such an outcome would constitute a Lib Dem gain: quite possibly their only one of the night.